The famous Steinsaltz Talmud of Rabbi Adin Steinsaltz is published by The Israeli Institute for Taludic Publications - Sifrei Milta. It is the only Talmud translated to Hebrew, fully punctuated and incorporating sentence and paragraph breaks. It includes the famous Beur of Rabbi Adin Steinsaltz which serves both as an introductory commentary, and an illustrated dictionary of the Talmud. The new Vilna edition is printed according to the classic pagination of the Rom Vilna edition in new clear letters with corrections and opening phrases bolded in Rashi and Tosfot. The opposing "Daf Habeur" includes the full puntuated text, a translation of the Aramaic, a summary of the opinions, the Halacha, the Sages and the background of the issues discussed. 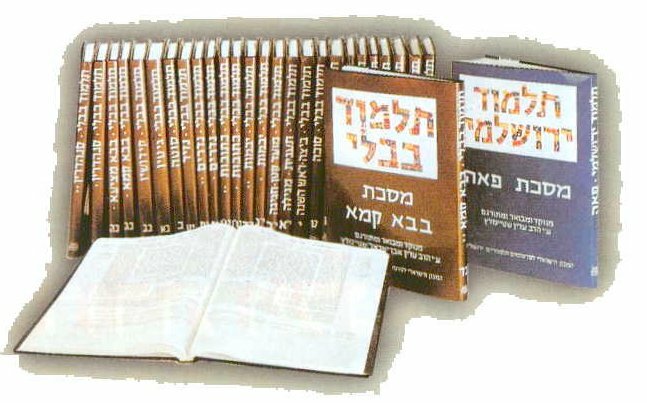 Tractate Bava Kama now appears with an additional 130 pages of the commentary Halacha Berura, a step by step explanation of how the great Rabbinic authorities have derived the Halacha from within the Talmudic discussion. You may order here the regular Steinsaltz Gemaras plus these new Steinsaltz editions along with other publications from Sifrei Milta at low Israeli prices. Just click on the orders link below.